The VocoPro Commander-FILM-HANDHELD is a camera-mount digital UHF wireless handheld microphone system offering easy operation and fast frequency switching for videographers and sound engineers in presentations, interviews, and ENG. It utilizes the 900 MHz band from 908.5 to 915 MHz to avoid interference from TV, radio, and Wi-Fi sources. 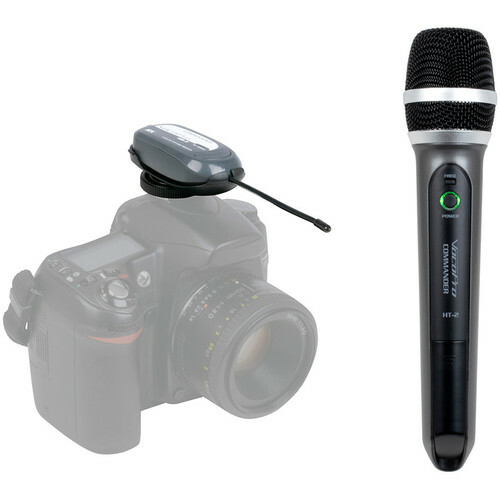 The system includes a wireless handheld microphone with a built-in transmitter and two AA batteries, a wireless camera-mount receiver with a 3.5mm TRS output, and a detachable shoe-mount adapter. The Commander-FILM-HANDHELD features easy one-button re-syncing for seamlessly changing frequencies if interference is encountered. An internal Li-ion battery in the receiver provides hours of run time, and conveniently recharges via USB. LEDs on the receiver clearly indicate power and signal status. The receiver's volume buttons allow efficient optimization of levels for your camera's input.